Taste test: These are smoky chips. These don't taste like sweet barbecue sauce chips, it's definitely a smokier flavor. 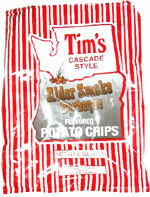 The typical thick-crunch of Tim's chips taste as good as always, but I was just a bit turned off by the smoky flavor. However, a colleague who likes smokier barbecue as opposed to "sweet" really liked these. Smell test: Very smoky flavor, like the smell around a campfire. 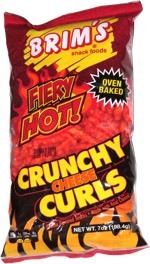 This snack was discovered by Keith at Albertson's.